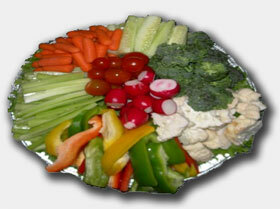 Our Platters and Baskets are made fresh when you order. Our tray sizes are Small (12"), Medium (16"), and Large (18"). A Small tray (all varieties) will feed approximately 8-12 people; a Medium tray approximately 12-18 people, and a Large tray 18- 25 people. A fresh assortment of cut fruits. Includes cantaloupe, honeydew, strawberries, white and red grapes, kiwi, and watermelon in season. Comes with a freshly made fruit dip. Perfect for a hot summer day. A fresh assortment of cut and chopped vegetables. Includes carrots, broccoli, cauliflower, grape tomatoes, celery, radishes, and cucumbers. Comes with a freshly made Ranch vegetable dip. Great for family gatherings. 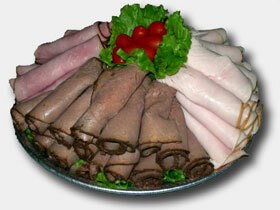 A large helping of fresh deli cut meats. Includes honey ham, Cajun turkey breast, and roast beef, but you can specify your own meats for us to use. Good for parties and special occasions. A specially sliced tray with three varieties of cheese, with a freshly prepared cheese ball in the middle. Includes Cheddar, Monterey Jack, and Swiss cheeses; but you can specify your own cheeses for us to use. Great for your wine or dinner party. A combination of our meat and cheese trays, with three types of meat and three types of cheeses. Includes the above specified meats and cheeses, but again, you may choose your own variety. Great for office and dinner parties. A freshly cooked selection of chicken wings, in either rotisserie or hot and spicy variety. A Small tray has 36 wings, a Medium tray has 72, and a Large tray has 96. Great for that tailgating party! A generous assortment of freshly prepared sandwiches, cut into quarters. We offer several different types: Chicken salad, Pimento Salad, and Combination. The Combo tray features honey ham, roast beef, and oven roasted turkey, but you can specify different types, or even our fresh deli cut meats. 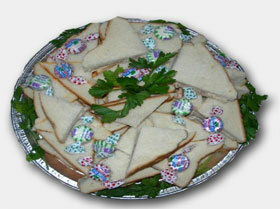 We can add cheese or cut the crusts off of the sandwiches, for an additional $5.00 per tray. Fantastic for any occasion. A quart size container of freshly made meatballs in barbecue sauce. Perfect for quick and easy dinners. Freshly made boudin, sliced and placed on a tray. Price varies according to amount and market prices. An assortment of cookies prepared for you. 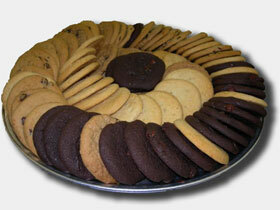 You pick the cookies from our large variety available. Price will vary according to your choices. An assortment of our brownies, made fresh for you. Price will vary according to amount. 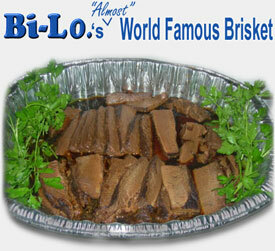 Our (Almost) World Famous Brisket is cooked fresh for you using our family recipe. We season, cook, and slice it for you. Call in advance to order. We can also cook beef or pork roasts, and turkeys on request. Price will vary according to amount and type ordered. We offer many different baskets - Fruit, Wine, and Liquor. We can also make a special basket just for you - use your imagination and ask us! Price will vary according to selection and type of basket. All prices subject to change with out notice.